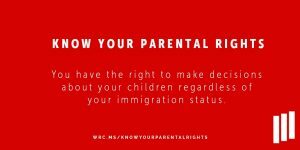 With reports of ICE raids and the separation of families at the southern border on the rise, the Women’s Refugee Commission has developed two new Know Your Parental Rightstools to help parents at risk of arrest by CBP or ICE understand and advocate for their parental rights. Know Your Parental Rights If You Are Arrested by ICE Inside the United States and Know Your Parental Rights If You Are Separated from Your Children at the Border are designed to provide “fast facts” that parents can review and memorize. We hope that these resources will be helpful to families both here in the US and arriving at the border, and kindly ask for your help in sharing them far and wide. Here you will find links to the fact sheets in English and Spanish.